Yes, you can take this literally. 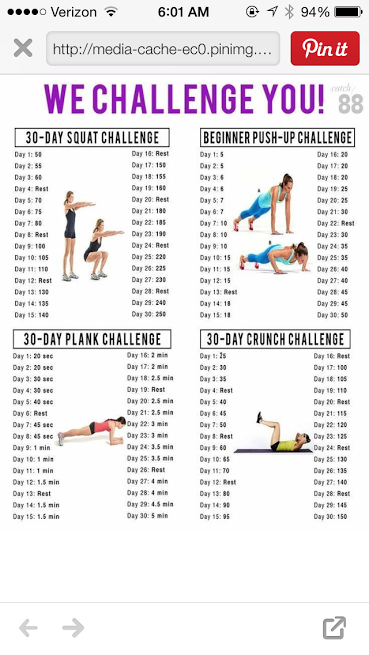 I am getting up early every day to do these exercise challenges. Like dark early. Even when I was traveling last week. It’s become a good habit actually. And I learned last week that we spend HALF of our day on auto-pilot, so maintaining good habits gets easier once they are in place. I think that is true, and I love the idea that I won’t have to try so hard to do things that are good for me. You’ve seen these before. You have friends who are all fit and fabulous and post this stuff so you can feel more lazy and out of shape than you already do right? At least that’s how I felt when I would see these. Like who really does that? Who has time to do that many squats in a day? I have attempted them in the past, but have never been able to finish them. And that actually made me feel worse. So why did I start again? Well that’s the story I’m about to tell ya! Last month my friend Evan, who is a personal trainer, invited me to a Gladiator Boot Camp. The name should have been enough of a warning right? I am not a gladiator, but it was free, and I really wanted to be a support to my friend who is launching his training business. So I went. The camp was awesome. But my fitness level was beyond pathetic. Now granted, I am over forty, but even when I was young I was never very athletic. This one hour workout was a glaring look at the reality that I could barely do 5 pushups. Girl push-ups. I was part of a team of warrior beasts who managed to carry the load and I did not contribute much at all to our objective. It felt awful. I’m too competitive, and maybe a smidge too proud, to be that poor of a teammate. That experience could have done a couple of things. It could have discouraged me, and I would continue to feel old and weak. Or I could use it as some motivation to strengthen myself. I decided to use it for the good, and am working on this at home. Maybe I’ll try it again, but not yet. I want to feel GOOD afterwards, not ready for an ambulance! Today I completed Day 16 on ALL of these challenges. I am over halfway there! No squats or crunches today but arms feel like rubber bands. But I am determined to finish these. And what I’m learning is that it is totally a MENTAL game, not just physical. Deciding to do this, telling others for some sort of accountability, and setting aside time each day to do it is all a huge factor in my success. Or failure. By the way a full day only takes 20 minutes, and that includes time in between to catch my breath! I am not competing with anyone but myself on this. I want to be stronger. I want to be healthier. I want to feel good about how I take care of myself. It’s the only self I’ve got! There are many things in my life I can’t change. But this. This I have some control over. And it honors God when I can be better, to reflect his glory. “Do you not know that your bodies are temples of the Holy Spirit, who is in you, whom you have received from God? You are not your own; you were bought at a price. Therefore honor God with your bodies.” 1 Corinth. 6:19-20. There’s some good motivation right there! So how do YOU rise to the challenge – whatever that is for you? How do you mentally tough it out, whether it’s the homework assignment, a new workout, or whatever God has in front of you? I’d love to hear….